I don’t know about you, but I have a lot of odd toys. Bits of broken things, odd wooden blocks, bits of rubbish from party bags. The stuff just seems to spawn with an unstoppable life force. Although I try to say no to as much of it as possible and regularly clear it out from our play baskets, I never throw it out. It is just so full of creative potential! This project is very open ended and adaptable for different ages. My kids were weary of my excitement for junk this time around so i decided to go alone. Also quite fun btw. A bunch of odd toys, wooden or plastic is fine. 1. 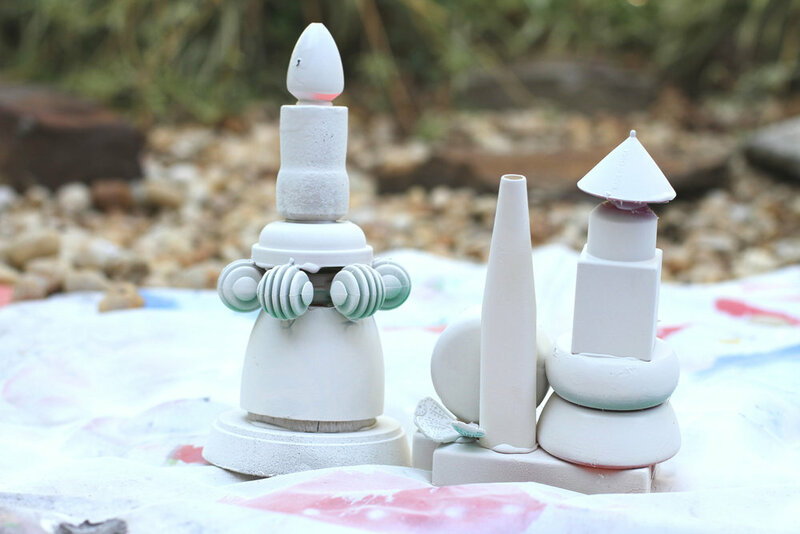 Play around with stacking and arranging your odd toys. Once you are happy with the arrangement, glue them together. Hot glue will be the easiest but wood glue may also work. 2. Spray paint your creations with matte white spray paint. This step is technically optional but you will get the best result by doing this. 3. The steps from hereon in basically go…DECORATE! I painted all the base colours first and let them dry. Next, I painted some designs over the top using a combination of paint applied with a thin brush along with paint markers. For some final pizazz, I added some wool scraps to the one of the tall toys that had an open mouth. There really are so many ways you could approach this project and modify it for kids of different ages. The older the child, the more detailed and complex the designs could be. It might also be fun to limit the colour pallets and just try monochrome or one or two colours. So go forth, assemble, paint and enjoy!